When planning your next trade show, business presentation, fair expo or event, a trade show roll-up banner is your best friend, with a tradeshow banner you can go to a small presentation or big expo and it will serve you as a big selling weapon, take it with you at the end of the presentation, and put it in the back seat of your car, but don’t forget that to get the best results with a tradeshow banner you need an expert and professional banner and Sign Design. Vertical Banner are call like that due to their vertical layout, our banner printing service includes a wide variety of options where we can print vertical or horizontal banners in different materials like Vinyl, Mesh or regular Vinyl Scrim material of 13oz. No matter how you want to expose your advertising banner, or in what material you want us to print it, Quick Signs will always give you the best banners at a fair Price. If you don’t have your design ready, No problem! 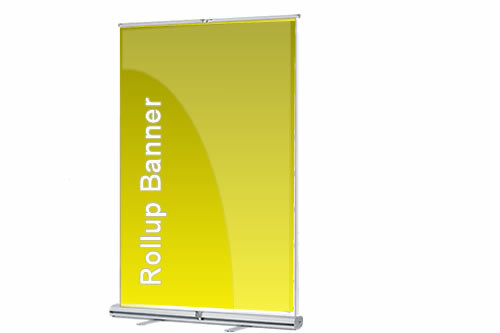 We will create a catching design to attract your visitor, do you have your artwork ready to print a Banner? Perfect! Call us today to speed up the process and print that banner right away for you. Looking for a banner sign that you can bring to your next business event of fair expo? Yes a retractable banner is the one that you might be looking for, retractable banners are the perfect portable signage tool, with a retractable banner you can commute from one event to the other, and feel free of huge packaging and hassle, the retractable banners roll up and extend to expose your business in a tradeshow, they will deliver your message, and then will retract and fold back into the banner stand to finally get into their carrying case. Retractable banner goes in your hand, rest on your shoulder, in your car’s back seat or with you in the bus, no matter where you go, retractable banners are the lightest portable selling tool. Want to order a Vertical today? The Quickest Turnaround Signs Shop in S. Florida! QuickSigns Inc | Florida Signs and Printing Company | Serving South Florida since 2005 | all rights reserved.